"The leading reason for most successful contract-related home projects, is that residents 'do' thorough enough service validations on contractors; the leading reason for most unsuccessful contract-related home projects, is that residents 'do not' do thorough enough service validations on contractors." When it comes to the home project you have in mind for which you anticipate authorizing contractor assistance, one of first things it is strongly recommended for you to do, is thoroughly research "contractors." That is, of course, pluralized since time and again it has been proven that your chances for getting the sort of service you need, in the reasonable price range you need, are much greater when you first interview at least five (5) contractors who are similarly skilled towards the sort of project you have in mind. The "initial research" entails asking around about the best contractors for the sort of project you need accomplished. Sources in this regard are ... ... word-of-mouth; 2. internet search engines; 3. contractors themselves. What you are looking for are contractors who are best skilled for the project. People can tell you anything; the internet can tell you anything; even the contractors themselves can tell you anything. It may take a while before you have at least five (5) likely candidates for your project. Please, do not rush a thing. Once you have your candidates, you can then set up a brief introductory meeting. Ten (10) minutes at most. It is recommended that you schedule these separately but in the same hour, on the same day. You will later hand each of them a special screening document (This is later introduced in this tutorial). Be certain they are whom they say they are. 8. 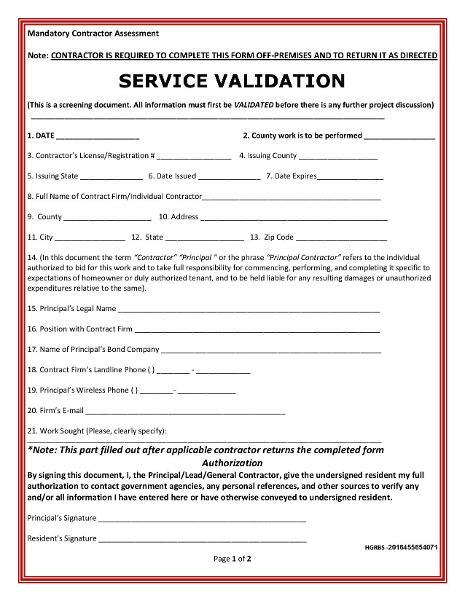 Ideally, after a day or so, depending on your research using the SERVICE VALIDATION SYSTEM, and checking the 5 recent residential references for whom contractor claims having done the same/similar work, please, make your BEST decision. Results must be 100% favorable, however. If not, it is recommended that you search for more reliable candidates using same procedure. Sometimes best candidates are just around the bend. Please, find them! *Please, Refer Now to the "Homeowner's Fast Track to Best Contractors" tutorial for your specific geographic region of the U.S.. If for some reason it is not active on this sight, please, notify us immediately!